I like finding a make-ahead dinner recipe, but when you can do all the work once and make an extra casserole for another night, I am in love. This make ahead dinner recipe for Easy Chicken Enchiladas is really not that time-consuming and well worth the effort of rolling another pan of enchiladas. My kids loved these and I am eating leftovers, well 2 enchiladas for lunch while I am typing this. My husband cooked 2 chickens on his rotiserre this weekend so we had a great start for this recipe. However, you can buy a rotisserie chicken from the grocery store, make your own shredded chicken in the oven or crock pot. Our store sells yesterday’s rotisserie chicken for a discount. The hardest part of this recipe was shredding the chicken. This is a great recipe to feed a crowd, as it will feed 10 people with a single recipe. Now don’t let your blood pressure go high just looking at the ingredient list. 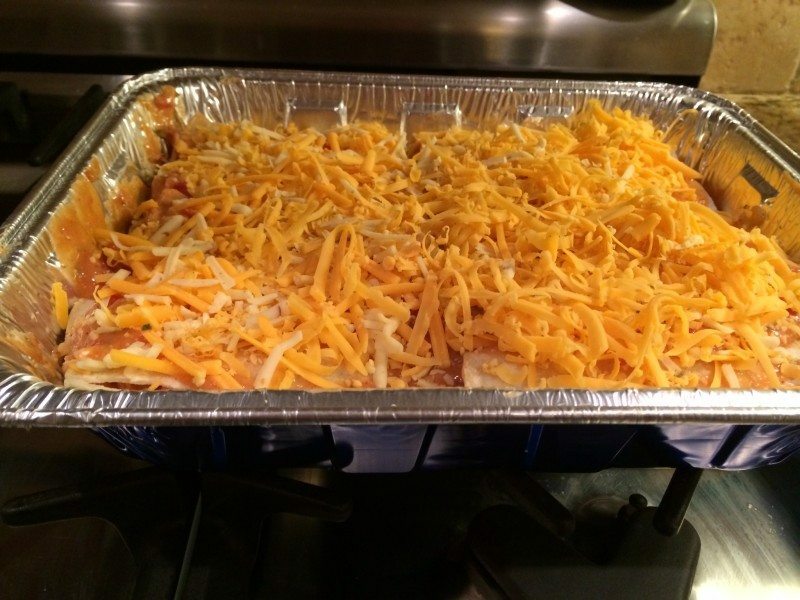 This is an easy Chicken enchilada recipe, I did not say healthy. I used low-fat and low sodium ingredients when I could find them. I buy the healthy select condensed soups, but the cheddar I could not find that variety. I used skim milk, low-fat sour cream and cheeses. I also used spring mix lettuces instead of iceberg. Once you have the chicken shredded, you can have 2 pans of chicken enchiladas, 21 to be exact in just minutes. I made the first pan, put it in the oven and then made the extra pan for the freezer to save time. I also used corn tortillas as I thought that was more authentic. They were a little smaller than the 8 inches recommended in the regular recipe so I uses less filling in each. 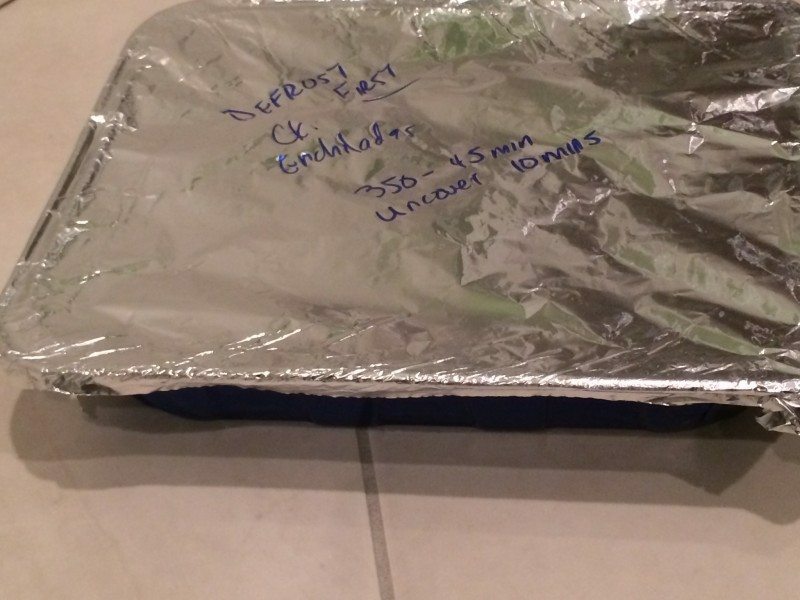 Be sure to label your extra tray of easy chicken enchiladas so you remember how to make them.. This recipe requires a defrost, wondering if you could just bake them longer frozen??? Any one have thoughts on that? Should have used Pan lining Paper like my video from Reynolds.. I just soaked the pan overnight. What a yummy recipe I might even try adding a can of rinsed black beans next time. Oh wait I have a pan waiting for me in the freezer. Remove meat from bones; discard bones. Shred chicken with two forksand set aside. In a large bowl, combine the tomatoes, soups, milk and seasonings. Transfer 3-1/2 cups to another bowl; add chicken and cream cheese. Spread 1/4 cup soup mixture into each of two greased 13-in. x 9-in baking dishes. Place 1/3 cup (1/4 for corn tortillas) chicken mixture down the center of each tortilla. Roll up and place seam side down in baking dishes. Pour remaining soup mixture over tops; sprinkle with cheese. What is your favorite Double Duty Dinner recipe? that looks delicious! I am always looking for new things to cook. Thanks for sharing. You mentioned cream cheese in the directions on step one but cream cheese is not in the list of ingredients? These look delicious! I love that I can make it and freeze one. Yum!! Those look great for a potluck or for helping someone out with a meal when they’re not feeling well, etc. Saving this one! !